Like many, I haven’t been watching much college basketball until March Madness. When did the uniform number 0 become so popular? Seems like nearly all of the games I’ve watched have had at least one No. 0 on the court, if not for both teams. Is it Westbrook-related? Aaron Gordon? Was the number not previously available but is now usable? I initially told him, “Eh, it’s just one of those things.” But then I saw a few tournament games over the weekend (much like James, I don’t watch much college hoops during the regular season), and I too was struck by how many zeroes — and double-zeroes! — I was seeing on the court. Of the teams that have made it to the Sweet 16, 13 of them have a No. 0 on the roster (including UNC’s Nate Britt, shown above), and two more — Oklahoma and Iowa State — have a No. 00. The only holdout is Duke, whose lowest-numbered player wears No. 2. I didn’t have time yesterday check the rosters of the teams that have been eliminated from the tournament — come on, it was my birthday, cut me some slack — but I’d be happy to post those stats if anyone would like to compile them for us. Phil is more attuned to college hoops than I am, so I asked him if he knew why these numbers are currently so popular, and/or if there had been a recent rule change, but he said he didn’t know. And I was too busy yesterday to do any real reporting on this (have I mentioned that it was my birthday? ), so I’m being really lazy here and asking all of you: What’s the story behind all the zeroes and double-zeroes in the NCAA these days? Is it a homage to anyone in particular? Is it in response to a rule change? Or is it just kids these days? If you know the answers to any of these questions, please enlighten us in the comments. Thanks. Bombs away: The Tugboat Captain got me some very nice birthday gifts yesterday, including a beautiful vintage bomber jacket that she had recently seen me admiring at a flea market. It’s just the right size — for Uni Watch boy mascot Tucker (whose own birthday is coming up in about six weeks, but I guess he couldn’t wait). KRC reminder: In case you missed it yesterday, the debut installment of my new McSweeney’s column, “Key Ring Chronicles,” is now up and running. It’s a reprise of the story about the quarter I keep on my key ring, which I’ve told here on Uni Watch several times, but we’ll have fresh content beginning later this week. This is a crowd-sourced project, so please share the link with friends who you think might be interested. And if you have a special object on your own key ring whose story you’d like to share, please send photos and descriptions/stories/etc. here. Thanks. Love NFL helmet style shown on this late-1970s vintage NFL notebook. (And it has team signals shown on the back, too!) Was always partial to this design, too, but only on pennants. The notebook style was on all sorts of printed materials, decals, etc. • Nice artwork on these 1970s-era Gale Sayers playing cards. • Check out this DIY Dolphins helmet clock! • The Chiefs design is timeless, as shown on this lightweight jacket from Starter. Can’t be 1970s as the listing says — more like 1990s, given the presence of the Pro Line logo. • “Phil” and Phillis” shown playing some ball on this 1970s Phillies coffee mug. • This 1970s Reds batting helmet doesn’t seem to offer much in the way of protection, does it? • Here’s a 1967 “NFL AFL Pro-Football Guide.” You get “Telespotter © Depth Charts For Lineup Matching.” And don’t forget, “American Airlines sponsors NFL TV Broadcasts and provides this guide to increase your viewing pleasure.” This thing had to be printed in the summer, which would really limit its accuracy — how would they know depth charts and starting lineups? • This 1970s Texas Rangers bobblehead (not 1960s as the listing states, obviously) is in pretty fair shape. Never had one of these, sadly. 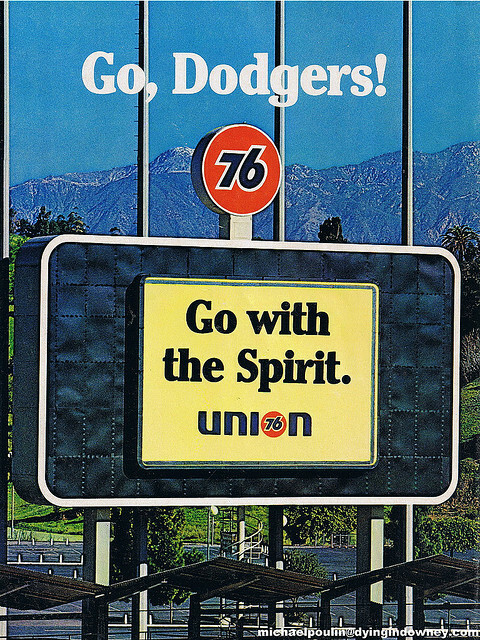 • I still maintain that the “’76” font on this Dodgers yearbook cover was done deliberately to match the Union 76 sign in the Dodgers Stadium outfield. Who’s with me? • Of course, I always swear that the three-stripe design for the Patriots’ road socks are a holdover from when Adidas did their uniforms. The three-stripe motif exists nowhere else on their scheme, and is well known as an Adidas device. Who’s with me? • Don’t recall this promotional logo, maybe because it wasn’t geared toward me. The listing calls this a women’s “Pitch for Chevy” (and Major League Baseball) promo shirt. Baseball News: The mother of Reds prospect Cody Reed guilt-tripped him into wearing glasses on the mound (from Chris Flinn). … The Red Sox and Cardinals went red-vs.-red yesterday (from Jaylen Lane). … The Bowling Green Hot Rods say they will wear stirrups this year (from Gary Moore). … Nice collection of old Cuban baseball photos and ads (from Ciaran Boyle). … The Padres removed their retired number signs that were atop the batter’s eye and replaced them with an ad for a casino. The numbers will now be displayed behind home plate. … The Nats are looking to sell the naming rights for Nationals Park. … A slow-pitch softball team in Fayetteville, N.C., is called the Dirty Stirrups. Pro & College Football News: The Rams will not be changing their uniforms until 2019, when they move into their new stadium. [I’ve actually known about this for two months but wasn’t allowed to say anything. It’s not surprising, given NFL rules and logistical realities. ”” PL.] … Interestingly, that same article says that while the NFL requires two years’ notice for a team to change its primary uniforms, only one year’s notice is required for changing throwbacks, and the Rams might therefore explore getting a new throwback prior to 2019. … Meanwhile, here’s an article about the Rams boxing up all their old gear in St. Louis (from Brinke). … Washington’s new AFL team will not be named the Bullets (from Phil). … Seems that Miami’s website uses a Photoshopped Dolphins game to make it look like the Hurricanes play in a sold-out stadium. James Gilbert notes that the end zones are Photoshopped, too. … Here’s as good a look as you’ll ever see at the no-frills jerseys that the Jets wore for preseason games in 1969 and ’70 (from @diegodougie). Hockey News: At least one NHL ref wore a No. 91 helmet decal in honor of injured linesman Don Henderson, who was checked by the Flames’ Dennis Wideman in January (from Stan Capp). … Minnesota’s women’s team won the national championship but the players were given Men’s Frozen Four caps (from @JeffreyBigMoney). NBA News: The Pistons still use the Bucks’ old logo on the visiting locker room door at the Palace (from Nick Haering). … The Pacers and Sixers went gold-vs.-blue last night (from Michael Preston). Soccer News: Newcastle manager Rafa Benitez wore Cartman socks this weekend (from @yellawkt). … Portugal’s Sporting CP wore intentionally misspelled names on its shirts in protest against counterfeit jerseys (from F.K. Yaaj). … Women’s retail jerseys have a lower neckline and shorter sleeves than men’s jerseys (from Phil). … New Nike kit for the Caltex Socceroos (from Phil). … Here’s a ranking of Australian soccer kits over the years (from Graham Clayton). Grab Bag: Vote here for your favorite NASCAR paint scheme of the week (from Joseph Dawisha). Not sure about zeros, but until around 1995, college basketball players really didn’t wear #1 or #2 at all. I always found this odd, and wondered about a specific rule about that. I think it was because when the officials signaled the scorer’s table (with their hands), it was feared that there would be confusion between communicating the uniform number and the number of free-throws after a foul. I’m not sure how they cleared this up, but I guess they changed their signalling format. Can’t have a digit higher than 5 in college basketball. I think the idea is the refs have to be able to signal the player number to the scorer’s table in one gesture, so if there’s a foul on 15, the ref holds up 1 with one hand and 5 with the other. Which is why there’s no 27s (or 7s for that matter). This obviously limits the number of #’s available, and a lot of programs like Duke, UNC, etc. have quite a few official and unofficial retired #s, further limiting the supply. Yes, I know that rule, and the reason for it. Wasn’t asking about that rule. Was asking about zero and double-zero. There used to bea rule prohibiting jersey numbers 0, 1 and 2, but that was changed. (It could have been ’95 that it changed – I would have guessed 15 years ago, but that is just me not wanting to believe the ‘new’ rule has been in place so long.) FWIW, since the stats program nearly every NCAA school uses only takes double digits, 0 and 00 are effectively the same number. Interesting. Do you know why 1 and 2 were prohibited? Adams said players used to be prohibited from wearing Nos. 1 or 2 as well, because it was thought to be complicating the referees’ signals for free throws after foul calls. That practice eventually ended. Likewise, he said the current rule could be circumvented if there was enough of a push in that direction. A guess: so an official flashing fingers for a one- or two-shot foul wouldn’t be confused with showing the number? The post that appeared before mine makes it look like a good guess. Thanks, Scott. I think 1, 2, AND 3 were prohibited at one time in both college and high-school ball because of the hand signals from the referee trying to make a signal in an extremely loud gym from across the court. Part of the hand signal that a referee would make is either a two-shot foul or 1-and-1. Of course, that also makes one wonder why they didn’t ban 11 rather than 1 because the referees often would hold up one finger in both hands to indicate 1-and-1. Even in loud gyms today, however, officials and scorers are pretty much trusted with being able to interpret most numbers from 00 to 55, so I’m surprised they just deregulate the number convention. Look in many very old yearbooks and you will find numbers which are currently illegal. I believe Wilt Chamberlain wore the number 76 in high school, for example. No origin story has been given, nor will it be. Simply a nickname. Now, if she was the captain of the Tug McGraw, that would be extra cool. I don’t expect/want Paul to confirm or deny, but I would assume it has something to do with the Galaxie 500 song “Tugboat” and its line “I just wanna be your tugboat captain”. Great song BTW, YouTube it. I can confirm that it has *nothing* to do with that song. I can clearly remember the day I got a promo copy of that single in 1988. Didn’t like it then, still don’t like it now (although I do like plenty of other Galaxie tunes). In fact, you may have just ruined the Captain’s nickname for me — thanks a lot! Ugh…. Dang, man, sorry. Not my intention at all– good honestly-earned nicknames are hard to come by. I think the person that really made 0 a thing was Gilbert Arenas (aka Agent Zero). His story was funny because people told him if he went to Arizona he would get zero minutes so it was his way of proving them wrong. This is exactly what I was going to say. I think Arenas was huge in taking 0 from a joke and turning it into something cool. Found this list… It’s outdated but shows Ostertaag started wearing 00 in 1992. And was used in the 70s as well. I shoulda mentioned: those are all Jayhawks. That vintage jacket looks like a Navy G-2. Is it authentic? Can see some nice aging on it. That’s a great gift indeed. No tagging, alas, so I don’t know its provenance. But it’s a really nice piece, and it fits me perfectly, so I’m hoping Tucker will let me wear it now and then. I found this New York Times article from 2007 on players wearing the number zero, seemed relevant! Just another side effect of the No Fun League. I rue the passing of illustration-style helmet emblems (Pat Patriot, Bucco Bruce, the Broncos’ “D”, the helmeted Dolphin), ostensibly because they are hard to reproduce. But they were colorful, humorous, and skillfully drawn. You can tell the difference between a good one and a bad one (USFL San Antonio Gunslingers, the first Jets’ design) so they had an obvious quality standard. i still have a folder with those NFL LOGOS like the notebook above. i put it on the wall as a display. looks awesome still. Yea, because shaming all Rams fans from anywhere outside of LA is going to help your image. Disparaging the Rams’ tenure in St. Louis is a crying shame. What was the Greatest Show on Turf? Chopped liver? I was especially proud of the players show of solidarity with the Black Lives Matter movement. If, when I go to an LA game from Michigan, I feel like I’m looked down on for not being from LA and supporting the team there will be hell to pay (like shaming fans publicly) because there is no place for shaming fans of your own team (and at least respecting the opponents team’s fans) in the 21st century. I just wonder if “jjwatts44” has seen the Browns or Jags lately. Re: the Hurricanes shop job: Let’s not let a little thing like the “Artistic Rendering – Subject To Change” in the bottom left corner of the image get in the way of a good “faked attendance Photoshop job” story, eh? Also, I’m wondering if that’s just a leftover on the site from when The U moved in to Sun Life Stadium (Dolphin Stadium at the time) back in 2008. If that’s the case, then there’s even less reason to make a big deal out of the image, considering it’s not exactly front-and-center on the site. I haven’t even been able to navigate my way back to that page showing the artist’s renderings from the rest of that site yet. I missed that myself, but great comment. Throws the writer’s cynicism under the bus, where it now belongs. I went and did a search for “Miami Dolphin Stadium” on the Hurricane Sports site, and a lot of the results were dated 07/25/2012, but I’m guessing that was a bulk archive date or something. Certainly, one of the results with that date is about “The Move” from the Orange Bowl to Dolphin Stadium (the article itself is dated from 2007). So, yeah, I’m fairly confident now that this is just old stuff that got stumbled upon and is getting regurgitated. The Canes Football twitter account replied to @EmptySeatsPics when that account posted a tweet about the photoshopped picture. So it’s already confirmed. And, of course, we still have trolls being trolls. it was only a matter of time before the Nats had to sell their naming rights. I have never liked the design of that park, the fact that it didn’t have a sponsor was one of the more redeeming qualities about it. Let’s remember: This will not a be a “sponsor”; it will be an advertiser. A sponsor is an advocate or supporter, without whom/which the thing in question would not be able to exist or survive. Companies that buy stadium naming rights (or patches on jerseys) do not deserve the term “sponsor”; they are simply advertisers. Teams and municipalities claiming poverty would probably disagree with you on that point, Paul. Though I think you’re right; a company buying naming rights to a venue is most likely more concerned about getting their name, their brand out there than with any civic responsibility. Let’s start with the case at hand: Nationals Park. Would it cease to be fiscally viable if nobody stepped up to buy the naming rights? I think not — it has done just fine for eight years now. If the rights are sold, the new rights-holder will not be “sponsoring” anything; it will simply be advertising. Now, a local business paying to put its name on a Little League uniform might legitimately be a case of sponsorship, because the team might not be able to exist (or at least not be able to afford uniforms) without the business’s support. Let’s keep that distinction in mind as we move forward. I’m just hoping it brings the price of beer down at the park. I think the Nats are somewhere near the top for beer prices. In response to Paul’s response to my comment, I thought it was pretty clear I was talking strictly in the context of naming rights to stadiums and similar venues. I work at high school and enjoy playing intramural basketball with the students. I believe zero to be a fad as every team in this year’s intramurals had a player in 0, one team even had a 00 and 0. LeBron’s kids wear 0 and 30 (for Westbrook and Steph, respectively). I’m willing to bet the rise of 0 has to do with the rise of prominent players in the NBA wearing it, like Westbrook. This was my inclination as well: Westbrook, Lillard, Love, Teague, Swaggy P, etc. The red on red game makes me nauseous. Is there a rule against that in regulation play? I don’t think so. I remember several years ago seeing a regular season Marlins vs. Mets game with both teams wearing black. It seemed rather crazy–especially since it was a really hot day, and it seemed as though wearing black would be a disadvantage. Of course, the rule could have changed, or it could have been a communication error…. I think teams try to avoid it in the regular season and playoffs, at least, but I thought there was at least one incident of navy vs. navy a few years back. I remember Braves in navy against some team in black…and the umps wear black too. That was really rough. Of course, I always swear that the three-stripe design for the Patriots’ road socks are a holdover from when Adidas did their uniforms. The three-stripe motif exists nowhere else on their scheme, and is well known as an Adidas device. Who’s with me? It hasn’t escaped my attention criticizing striped socks on these pages earns a greeting with torches and pitchforks. So I’ll go so far as to say it’s the one of the two details I like about the New England uniforms, the other being the red facemask. The Pats had three stripes on their socks before the current set, from about 1984 to 1992, so it’s not completely new (though the Pat Patriot-era socks had red-blue-red stripes). And three stripes have appeared on several other teams’ uniforms without it being related to Adidas; the Bears’ three-stripe sleeves date back to 1932, 16 years before the Dassler brothers broke their company up into Adidas and Puma. Still, I won’t totally discount the possibility in the Pats’ case of the stripes being related. Tons of NFL teams had triple-striped sox that didn’t necessarily correlate to anything else in their uniform programs. It was a very common trope (although not anymore, sadly). Sometimes three stripes are just three stripes. I was at the Iowa State/Little Rock game and I noticed that Little Rock had a player who wore #0, but he was listed on the scoreboard as #00. I just thought that was strange since other single digit players weren’t listed with an extra zero on the scoreboard. What’s wrong with that Reds helmet? well, not much in the way of protection for one thing. I don’t get what you mean by that. It’s just a normal helmet, like every other helmet with an earflap. In what way is it lacking in protection? Kids like having the single digit numbers. With only 5 numbers available, the number 0 has become more popular. NY Times wrote an article that is interesting. I’m thinking it has more to do with Gilbert Arenas/Russell Westbrook than a shortage of numbers. My first memories of anyone wearing a version of zero was the Chief, Robert Parrish wearing 00. If it was a single 0, then Orlando Woolridge comes to mind. I actually miss it in football. Jim Otto, Kenny Burroughs… no reason it shouldn’t still be worn. The Lehigh Valley Iron Pigs might be the best at minor league promotions. I love this one. They might be the best, but this one is just a copycat of what the Fresno Grizzlies did last year, when they became the Tacos for a game. Don’t get me wrong — I love what the IronPigs are doing here. It’s a really fun promotion. But it’s not an original idea, so let’s not give them tooooooo much credit. Purely anecdotal, but it feels like Gilbert Arenas as “Agent Zero” really gave 0 a breakthrough as a “legitimate” basketball number and not a clown or mascot number. Yep. I’m betting that influenced Westbrook, who also wore it in college. This new group of college players probably wear it because of Westbrook, not Arenas. Eric Montross was the first at UNC (1991-1994)to wear only zeroes, https://s-media-cache-ak0.pinimg.com/736x/fe/e5/6e/fee56e6b0c59ac2a0d3ee170de42d6a5.jpg. A practice he continued in the pros with either #00 http://cache1.asset-cache.net/gc/72537923-mar-1999-eric-montross-of-the-detroit-pistons-gettyimages.jpg?v=1&c=IWSAsset&k=2&d=LOxlJB53FQml1VeWI6W%2BGpVvS6wbLGTbmsu4LV6ohlrDLfz2KsG6qNJyy0F4tlns, or #0, http://static0.thesportsterimages.com/cdn/864/1203/90/cw/wp-content/uploads/2014/12/Eric-Montross.jpg. Minnesota’s women’s team won the national championship but the players were given Men’s Frozen Four caps (from @JeffreyBigMoney). All the more reason for players of any sport to not wear those dumb “locker room” hats/shirts after the big game. (Yes, I know it’s all about the money/merchandise.) The second they get to take their helmets off and show off some victoriously sweaty hockey hair, and on goes a cap. For the other sports, I would much rather see players celebrate in their actual jersey, they ones covered in mud, dirt and blood that they gave to win, than in a cheap cotton tshirt. How infinitely worse would this photo be if these guys were wearing locker room hats? Duke has only had one #0 (or #00) – Austin Rivers in 2011-12. I am with you on that one Brinke. Subtle branding from 40 years ago. I’m not with you on that one. I doubt they would make that many obvious changes to the number forms if they were trying to make a deliberate reference. If the top of the 6 ended in a line parallel to the top of the 7, rather than at an angle, I’d be more inclined to buy the idea. I may have missed this previously, but is there a rule against having a 0 and 00 on the same team (sort of like having a 1 and 11)? I know effectively 0 and 00 are the same number, but not for uni-purposes/looks. NCAA, I think so, but in the NBA, no there is not. The culprit is/was computerized score-keeping systems that cannot differentiate between zero and double-zero. Between 1 and 11 is easy: the computer sees 0001 and 1011. There’s no way that’s a problem. I’ve never understood how 0 and 00 really caused a problem for computer scoring. I mean, even if the computer isn’t able to tell them apart, there’s only 12 players on each team. 0 is 0 and 00 is any other number not worn by a player on the team. So you track 00’s stats as 99 or 69 or 71 or whatever, and then just fix it before you officially publish them. So in practice, you’re proposing an unused number be a dummy variable for #00, in case a 00 and 0 are on the same team? That sounds like a pure headache, especially since deadlines are deadlines for journalists. The only thing I’ll grant you is that because consistency would be essential, it just might be stupidly crazy enough to work in baseball and hockey. #00 in the scorecard could be #42 in a baseball system or #99 in a hockey system. The Wizards once had 00 (Brendan Haywood) and a 0 (Gilbert Arenas) at the same time, I think. Arenas was in Golden State when Haywood wore 00 in Washington. When Arenas came to town, Haywood switched to 33. Actually, there is a current example right now in the NBA: Darrell Arthur (00) and Emmanuel Mudlay (0) on the Denver Nuggets. They even started last night’s game in Cleveland together, so they’ve definitely been out on the court at the same time this year. Mudiay, not Mudlay… misread that. My bad. 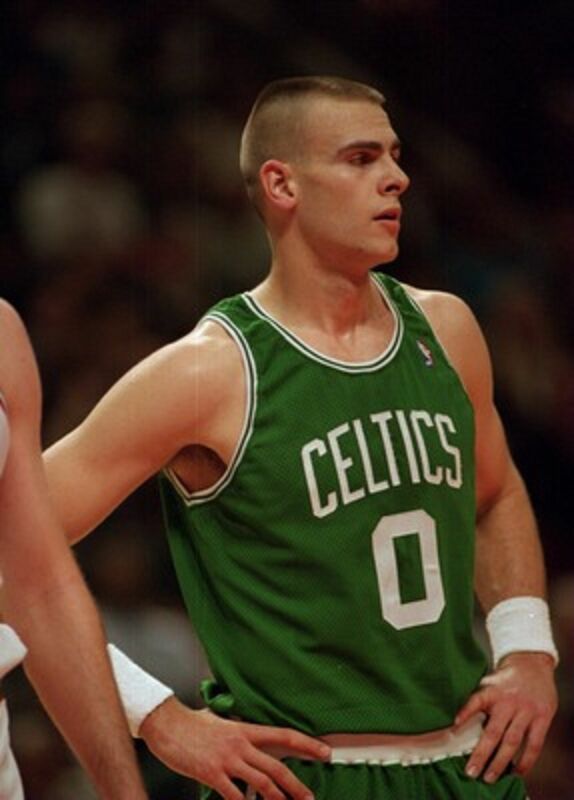 First UNC player with only zeroes, #00 Eric Montross (1991-1994). #1 and #2 weren’t assigned until the early 2000s. How about naming the NFL team the Bullets? Call the arena team the Wizards and bring back the Squires for the NBA team. Nah. Just rename the Wizards the Bullets. Nobody cares about AFL and I suspect it’ll die after a few seasons here. It’ll be interesting to see what they name their upcoming D-League team. You can only come up with so many Wizards based spinoffs, and Mystics and Magic are already used. They can’t do what the Bulls did, since this team will actually also be playing in DC. That is an utterly nonsensical idea. But then again, this is Washington we’re talking about. The resurgence of players wearing number 0 is directly related to Gilbert Arenas’ short-lived NBA stardom in mid 00’s during when he earned the weird nickname Agent Zero. Dude immortalized that number for every player who feels underrated to wear as a scarlet letter (number). He (allegedly) chose 0 because people in high school told him he’d play zero minutes at Arizona, which is kinda silly because he was a HUGE recruit coming out of high school in Cali. Nick Young (Gil’s buddy, played with Arenas in DC) just started wearing it as a Laker. Westbrook’s from LA (as is Arenas) so it’s fair to assume he was influenced. Everyone else (ie: Lillard and all the other players) is just riding the bandwagon, probably because of Westbrook. I doubt a youngster like Nate Britt (who’s from DC) even vividly remembers the Arena Era. Of course, Orlando Woolridge was the first guy I knew to wear it, but that was in the 80’s when most of these players weren’t even born. Well…Damian Lillard says his zero is like an O for Oakland (childhood and high school), Ogden (Weber State), and Oregon (his first pro spot). The Toothpick Revolution has begun! While I prefer the royal blue and yellow Rams uniforms their current ones are bad they just need to fix the collar and ditch the navy pants. When I was in high school in Wisconsin in the ’70s, basketball players couldn’t wear 6, 7, 8 or 9, nor could they wear single digits. Refs had to have something for each hand, I guess. That still left us 10-15, 20-25, 30-35, 40-45, 50-55. Just like when single digit numbers became “cool” mainly due to their uniqueness in the late 90’s, 0 and 00’s rise in popularity is the latest in a long list of items that trend throughout basketball. Here is a very incomplete list of items that have seen a similar spike in popularity fueled mainly by hype surrounding the tastemakers who set trends within the game of basketball and trickles down through the levels of the game.